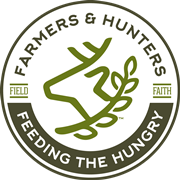 FAQ's - Farmers and Hunters Feeding the Hungry - Hunt Down Hunger! Is deer and other big game meat safe? Yes, all game that is donated to the program are inspected by a qualified meat processor that is contracted by FHFH. Venison and other big game is nutritious, low fat and is high in protein. Aren't deer hunted just in the fall? No. While most recreational hunting occurs in the Fall, some antlerless deer seasons now occur in the Winter and most crop damage permits are issued for the Spring and Summer. The program is year-round. How much does it cost to donate a deer? In most cases, nothing. If you donate an entire animal, all processing costs are paid for by the program. Does my donation help in my local community? Yes, in most cases the donated meat finds it's way to a food bank located in the county where it was donated. It will them be distributed to county feeding programs. Can I "write off" my donation? How does an individual in need obtain venison? Most statewide food banks make the venison available to their member feeding agencies, not the public. Church pantries, Salvation Army, community food banks, community assistance programs and other member feeding agencies determine the need of individuals and distribute accordingly. A list of member feeding agencies in your area may be obtained from your nearest statewide food bank.